OBJECTIVE: Create a photomontage to communicate a specific message. A photomontage is an image that has been assembled from different photographs or from a single photograph that has been altered. By adding or removing information in the form of words or images the final meaning is altered. The resulting photomontage may be artistic, commercial, religious or political. 1. Recognize the familiar: The viewer should recognize some of your images. 2. Contradiction: Contradiction in the content and meaning of images causes the viewer to think about the message. 3. Seeing through the lies: Many photomontages invite the viewer to look behind the surface to gain greater insight into your message. 4. Exaggeration of scale: Altering the scale of images can exaggerate your message. 5. Figures of Speech: Visualize figures of speech to spell out your point. Puppet on a string, playing with fire, house of cards, the camera never lies, etc. 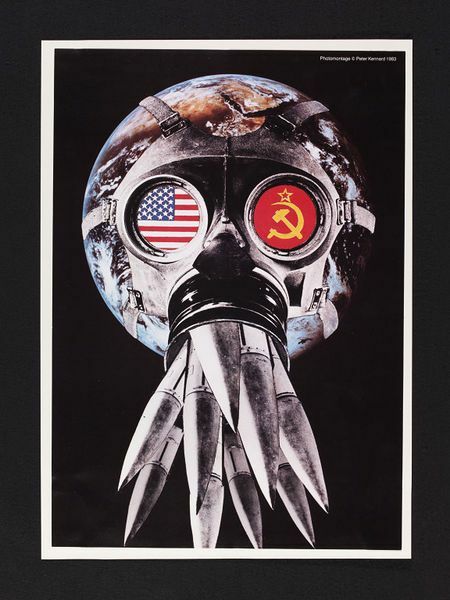 A gas mask covers the globe with the mouth piece vomiting up an excess of nuclear missiles or being choked by war. The eyes are replaced with an American Star and Stripes on what would be West on a map and its counterpart, the East, replaced with the Soviet Hammer and Sickle. Kennard has been making satirical photomontages since the 1970s, first through his work for the Anti-Vietnam movement and then, famously, through his images for the Campaign for Nuclear Disarmament. Step 1: Research political photomontages. Step 2: Brainstorm ideas for your message. Step 3: Gather high resolution photographs and download to a folder on your desktop. 19"x 13", resolution is 300. ​Step 5: Using Photoshop tools, cut and paste the photomontage together.